My colleague recently got himself a Motorola Milestone at a good price, and so we have been exchanging tips on enhancing our Android experience. He is a successful example of an iPhone-to-Android convert who is simply impressed with the customisation possibilities of the Android platform. In this post, I’d like to share my experience of Android apps on Samsung Galaxy S, but it may apply to other Android phone users. What does that mean? It means that every icon you press to execute, be it the Phone, Messaging, Camera, Contacts, Calendar, Internet, Email – they are all apps. And the beauty of Android is that any of these apps MAY be replaced by third-party apps downloaded on the Android Market. For instance, there are Messaging apps like the popular Handcent SMS that replaces the stock Message app on your Android phone, that offers lots of customisation. Then just replace the existing Messages icon on the home screen with the Handcent icon and thereafter you will manage all your SMS/MMS via the new app. Isn’t that fabulous? OK on with the list! All Android phones comes preloaded with Android Market app that helps you find apps. But that is not the only app that does that. AppBrain is one of my recommendations. With AppBrain, you can manage your apps on your desktop web browser, selecting apps to install or remove, and sync via the AppBrain app on your phone to apply the updates. You can also follow other AppBrain users to see what apps they installed, so that you can also choose to install them. You know the home screens and the app drawer that defines the look of your phone interface? Well, you can actually change the app too! And when you do, your phone will look, feel and react in an entirely different way! 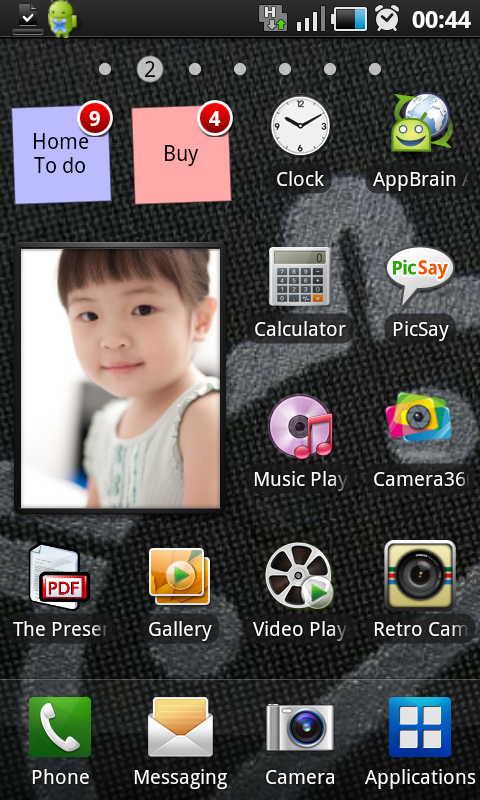 For instance, using ADW Launcher, I can fit 6×5 icons in one page! It doesn’t look at all cramp on the Samsung Galaxy S because the screen size is 4-inch. Don’t worry about RAM, because the launcher app is a direct replacement of your stock launcher app, and does not run on top of it. Android runs not unlike a desktop PC. It is built to multi-task, and so unavoidably you need to manage the tasks running in the background so that you have enough memory to run other tasks. 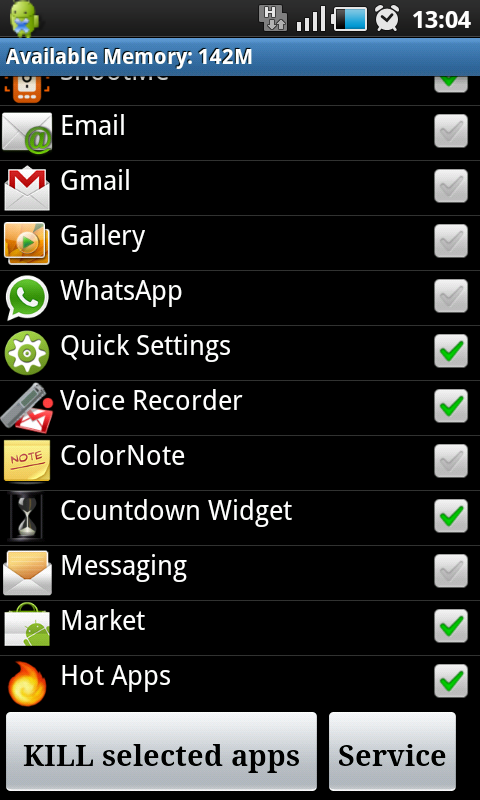 Good thing about Samsung Galaxy S is that it comes with 340MB RAM, and so I never have memory utilisation problems. On top of that, the phone has an internal memory of 2GB to install my apps. Not forgetting, there is also 14GB of user memory for me to store all my photos, videos, documents. And that’s not considering I can insert an external microSD card of any capacity to boost the already generous memory. If your phone has limited memory, you would need an app to tell you what apps are still open in the background and you would want to “kill” them to make room for other apps. I use Advanced Task Killer to monitor my open apps and selectively kill them, either automatically or manually. A file manager app allows you to explore your folders so that you can choose to browse the documents or delete the unwanted files. I use ASTRO File Manager because it’s recommended by a friend. ASTRO has a built-in photo viewer, allows bookmarking of folders, offers additional system tools like backup apps, process manager, display folder sizes. Definitely better than most file manager apps provided by phone makers. There are many apps out there that can help you improve the performance of your Android phones. If you find the existing keyboard hard to type, look for alternative keyboard apps. Better Keyboard 8 is my choice, as it offers a larger key size and auto-correct is smarter. If you find the screen lock irritating, there is an app called No Lock to keep the screen unlocked at all times. If you want to adjust screen brightness, volume, turn on/off mobile data in one shortcut, you can try Quick Settings. If your phone does not tell you the remaining battery percentage (Galaxy S doesn’t! ), install Quick Battery. If you want to monitor the battery utilisation and accurately estimate the battery drain time, try JuicePlotter. Samsung Galaxy S is known to have laggy interface issues. Apps do not load instantly, screens freeze for seconds before refreshing. I find it unbelievable that a phone running on 1GHz Hummingbird processor runs oddly retarded. The problem lies with the filesystem that Galaxy S uses. To overcome this, you have to modify the filesystem using various methods, all of which requires the act of “rooting” the phone. “Rooting” is not necessarily a bad word, it merely means to access the root of the phone OS and to modify some of the settings only accessible at the root level. Many Android enthusiasts have already released reliable programs to modify the OS and improve the phone performance. But like any other hacks, be prepared for occasional phone bugs that surface during use. In my experience, these bugs go away after a reboot. I use the SpeedMod kernel to improve my Galaxy S performance. More info on rooting here. In my next post, I will share the apps I use for photo editing, media playing, voice recording, note taking, and social networking. 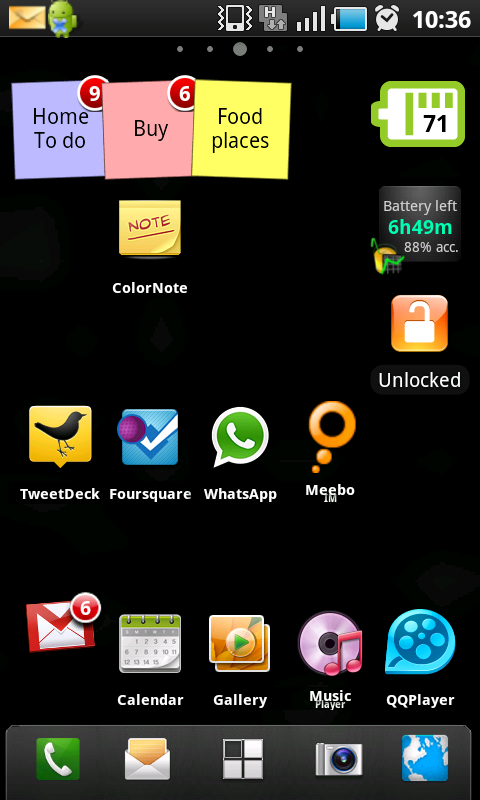 Pingback: Part 2: Android Apps on my Samsung Galaxy S – Music.Photo.Life.